Communication today is increasingly virtual. Think about all the times you've shot off a text or email versus picking up a phone. You're not just talking to your homies; you might also be texting a hair salon to see if there's an appointment available this weekend, or setting up a dinner reservation through an app. Businesses of all kinds are adapting to meet people on the communication channels they are already using. Enter Facebook Messenger! This week, we’re going to set up Messenger for your company Page so it can help you run things a little more smoothly. If you're not already aware of this, heads up -- users can send your company Facebook messages! Open your company Page, and look at the top left to find the Inbox, where you'll see all the messages you've ever gotten on Facebook (and Instagram, if you're using it). You'll also find mentions of your Page here, and comments on your Instagram posts. Before we get into how to start setting up Messenger for success, let’s crunch some numbers to show just how many people this platform can reach. Facebook Messenger has 1.2 billion users a month. That’s right, BILLION. And those 1.2 billion users send 2 billion messages to businesses each month. Basically, Facebook Messenger is kind of a big deal for doin' biz. Not only are all of those users on the platform, but they prefer it to other methods of communication! It’s fast, easy, and hella accessible since Messenger is integrated into an app they’re already using. Messaging is the second-most popular form of communication for customers when interacting with brands. 53% of people are more likely to shop with a business they can message, and 56% of people would rather message than call customer service(same, girl, same). If you’re not convinced at this point, skim those numbers again. Now let’s get to the set up! These three sections contain all the cool things you can do with Messenger, such as prompt people to start a conversation, auto-respond to inquiries, and even remind people about appointments. We’ll walk through the categories one by one, starting with General Settings, so follow along with us down the page. The first thing you can choose is whether or not you want to be able to just hit your enter or return button, instead of clicking on send. For those of you who are skilled typists, go for it. For those of us who may not have the most nimble fingers, consider turning this off to avoid awkward mishaps. That decision is easy! Next, decide whether or not you want to prompt your users to send you messages. You’ve probably seen this before, when you go onto a company’s Facebook Page and a little Messenger box pops up from that company, all like, “Hey, what’s up? Wanna chat?” This is a way to engage with a customer one on one at the moment that they're looking for something from you on your Page, whether it's your phone number or your opening hours. The third (and coolest) choice on your General Settings is whether you want to help people start a conversation. What if they get to your Messenger window and freeze? 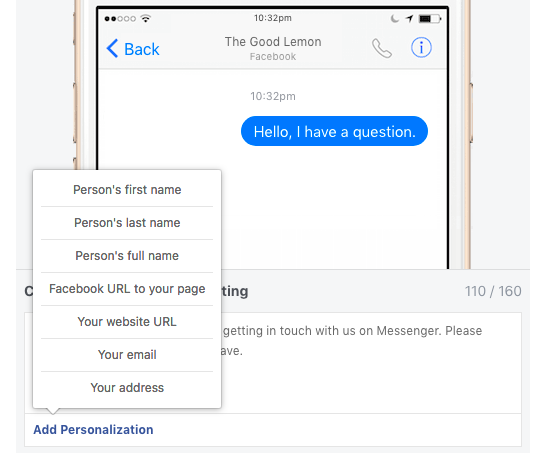 This setting allows Facebook to show a user a list of the most commonly asked questions, depending on your Page category, and you can select what questions appear. Do you want to send instant replies to anyone who messages your Page? You should consider doing this, especially if you get a high volume of inquiries. It’s a great way to be like “Hey (name), thanks so much for your message! We’ll respond as soon as we can. If your question is urgent, please reach out at (insert number here).” That way your audience will at least know you’re working on their inquiry, even if you haven’t actually seen it yet. The second setting in this section is all about the response time. You know how when you go to a company's Page you can see if a company typically responds in an hour or within the day? This will update automatically based on your own response time (and automatic messages don’t count)! So if you can't get to your messages immediately, this buys you a little time. Think of the third setting as an away message; here you can turn on an automatic response, such as if you’re stepping away for lunch and want your audience to know you’ll BRB. We promise we’re almost done with the settings! Last, but not least, is whether or not you want to remind and/or follow-up with people who book appointments. If you're running a service-based business, you can use Facebook to manage your appointments and even sync it to another booking platform you might be using, making it as easy as pie for your customers to book with you right away. We hope you'll spend a moment or two checking out these options as you're upgrading your company Page overall, because making it convenient and fun for your audience to interact with you is what will keep them coming back.